Are you looking for a complete Kenexa Excel practice experience? 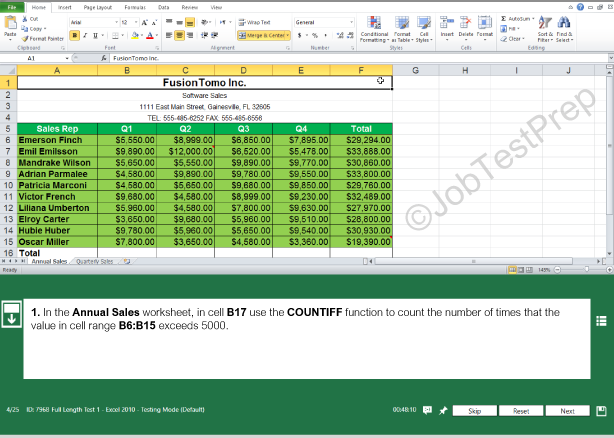 Begin your practice with our free and unique Excel sample questions. These will cover the full range of questions and topics you may face on the real test day. Take a look at our Kenexa Excel sample questions and start practicing today! Below is a selection of sample questions similar to the Kenexa questions you might face on your Kenexa test. To get a real full preparation for the Excel Exam, simply click Get The Full Preparation Pack below. Before proceeding to the questions, copy the table below to a new Excel spreadsheet. Validate that the cell marked with (A1) is located in cell A1 on the spreadsheet. Once the table has been copied, continue to the questions. Set the Text Alignment to "Right". Insert a new row between "Michael" and "Amber". Set the Page Orientation to "Narrow". Highlight every cell under "Salary" higher than 70 (th. $). Under “Reference”, in cell D4, combine “Employee” and “ID” (like in cell D3) using a function. Create a PivotTable for "Salary" per "Seniority". Submit your answers to the questions below and fill the consequent form. A PDF file with answers and explanation for all questions will be sent to the email provided by you. Click below for the 2016 Kenexa Prove It Microsoft Office Test Excel test to get a real full preparation for the Excel exam.